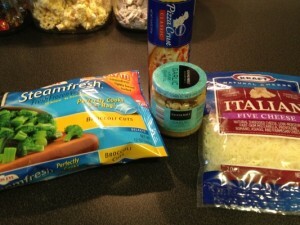 In continuing with making our own pizzas, this time we’ll try a veggie pizza. It’s not Friday, but Jen and our daughter like broccoli and we got it FREE at Remke the other day, so let’s put it on a pizza. Also, the pizza crusts are on a special deal right now at Kroger for $1.25 each. We won’t use a typical tomato base to keep it lighter. 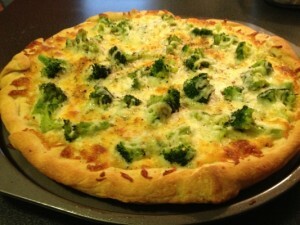 It is super cheap when using free broccoli, cheap crust and cheap cheese! This is my recipe and I think it works pretty well. I have also added the recipe card at the end of the post. We follow the basic directions for the pizza crust and unroll and spread out on a pizza pan. We then melt the margarine and add the garlic and garlic powder to it and mix well. We spread this around generously on the pizza crust. Then into the oven to prebake for about 10 minutes. After the crust is prebaked, we top with a layer of cheese making sure to cover right around the edge of the crust. This is especially important since we have no sauce. 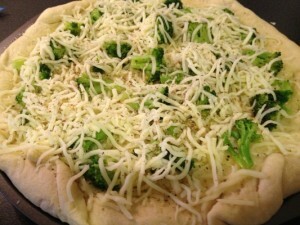 Add your broccoli and top with a bit more cheese. Then back into the over to bake for about another 10 minutes.The girls seemed to like it, but a little to bland for me with no sauce or meat LOL. I’ll have to come up with something a little more hearty for Friday’s pizza. 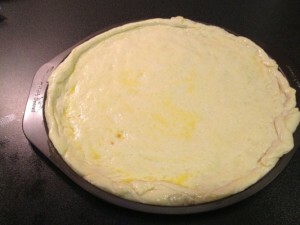 We follow the basic directions for the pizza crust and unroll and spread out on a pizza pan. We then melt the margarine and add the garlic and garlic powder to it and mix well. We spread this around generously on the pizza crust. Then into the oven to prebake for about 10 minutes. After the crust is prebaked, we top with a layer of cheese making sure to cover right around the edge of the crust. This is especially important since we have no sauce. 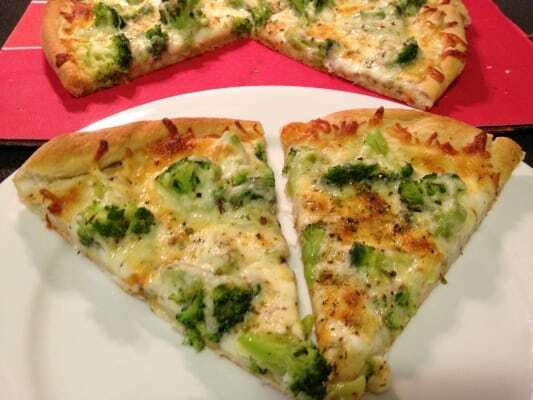 Add your broccoli and top with a bit more cheese. Then back into the over to bake for about another 10 minutes.